3.5 out of 5 based on 95 bloggers and 28 commenters. 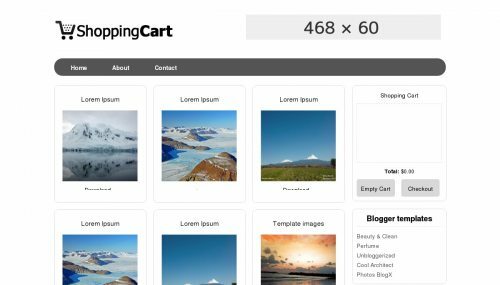 Shopping Cart is a free blogger template with 4 columns, right sidebar, gallery-styled, minimalist, an exclusive design for Blogger, ads ready, footer columns, posts thumbnails and neutral colors. How to use the shopping cart widget? I want to use but i have a problem upon clicking it in. I don’t see its working. Maybe you can teach me how to make the link to my shopping cart widget. Thank you for the co-operation. @Aizat: Please follow the link “Template settings” above. Gimana cara posting agar harganya bisa tampil di bawah gambar ??? Cara supaya pada saat klik gambar, harga bisa muncul di shopping cart nya….???????? Visiting dignitaries of the state to other countries on their arrival is given bouquet as a mark of respect. The winner of games like Olympics are gifted with a bouquet made out of flower which are unique of that country, of course followed by a medal. @Francisco:Hi Francisco, may you teach me how to change the checkout so it will send me an email about my customer’s order? because in my country people no familiar with paypal and google checkout. Thank you for the updates. Keep it up. Ill be using this all the time since i like the format and arrangements as well. And very good design so far. Shopping cart tech is Well for world. Shoppers may view the contents of their shopping cart at any time and may add or delete items as needed. it is really use for me but some problem add for shopping cart. suka akan template ini sebab “gallery-styled, minimalist, exclusive design” Baru-baru in saya menghadapi masalah bila navigationnya tiba2 teralih dari kedudukan asalnya serta mencacatkan pemandangan ke blog saya. 2. navbarbya juga tak dapat saya cari. Thanks For Sharing A Nice Blog Templetes. Appreciate it if anybody can help me. I can’t load the template. I get “Unable to save your template…” I tried to copy and paste it also with error. Infact most of the template I get the same error. I am setting my bookstore blog and this template is perfect. In my site, the majority of navigation goes via searches on labels as in the column on the right. But out of 17 search-queries 6 of them do not show all the posts that are available based on it’s label and the display stops always after 10 from 15, 8 from 13, 11 from 13, 5 from 20, 5 from 6,9 from 16. Eleven other labels show the right number of posts. When creating the widget in the editor and you get to select the labels, the total numbers are okay. I have no clue where to search for a solution. kok akeh sing komplain, ya ? pingin pasang tapi kok malih ragu-ragu. very good template so far but i have problem with the shopping cart. it’s not working . please help. Por favor, me envie o link para download do template Shopping Cart em português! What a great post! Apart from the really useful tips, it’s just really fun to discover how a blogger works and what tricks they use! Thank you so much for your tips!! visit my site – زيادة متابعين انستقرام. check out via emailnya gak fungsi ini. setelah nempelin script di atas blog saya malah jadi NGE-BLANK.. gmana nih??? trus ada cara gak buat ngerubah harganya ke rupiah dan ceck outnya langsung ke internet banking??? how to create a post with add to card function?